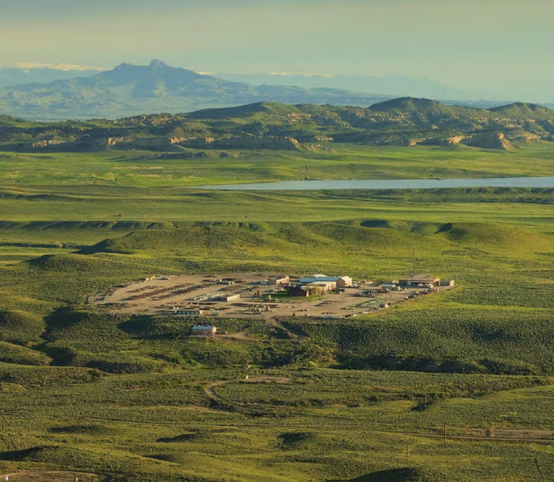 The 134 oil fields in the Bighorn Basin have produced over two and a half billion barrels of oil. 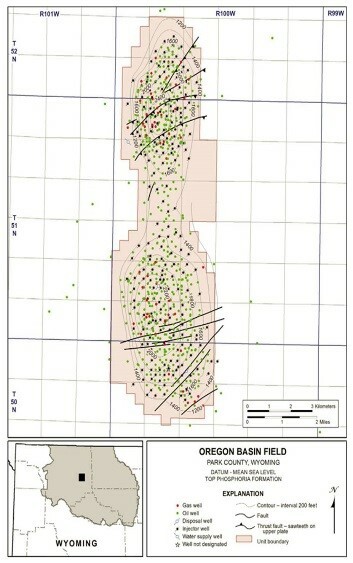 Oregon Basin Field is a good example of one of these fields because of its large size. 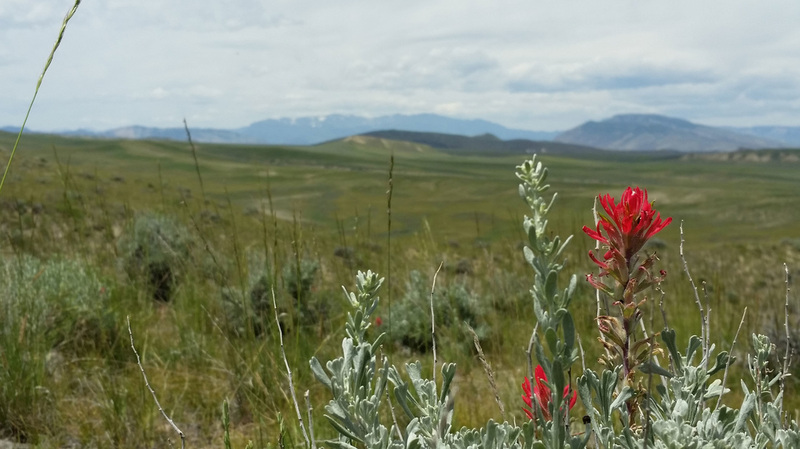 The name of the field comes from a weak, ornery bull who was cut loose in late fall from William Carter’s 1879 cattle drive from Oregon to the Bighorn Basin. This was the first large herd in the area and would be the beginning of the Carter Cattle Ranch on the South Fork about 30 miles southwest of Cody. 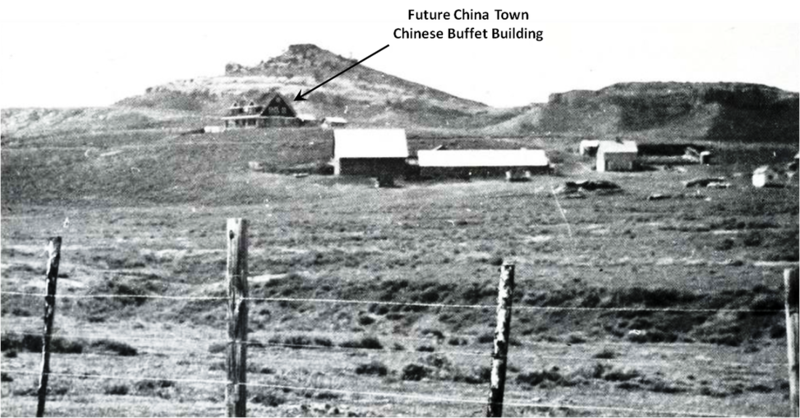 Carter Ranch was sold to Buffalo Bill and renamed the TE Ranch in 1895. When spring came the bull was discovered alive grazing in an area that looked like an enclosed basin, and so the Oregon bull’s pasture was called Oregon Basin. Oregon Basin Area. Black dotted line shows the rim rock wall (Kmv) that surrounds the field. Image from Google Earth. The geologic structure at Oregon Basin is an anticline. This is a feature where the rocks are folded upward with the younger rocks on top of the older units. As the feature erodes it begins to look like a sliced onion, with older layers toward the center. The resistant rim rocks on the flanks of the field are sandstones of the Cretaceous Mesaverde formation (Kmv) that were deposited in a shallow seaway about 75 million years ago. The anticline has 5,000 feet of structural relief, which is significant. The anticline is separated from the central Bighorn Basin by about 20,000 feet of vertical displacement along the north-south trending Oregon Basin fault. For comparison, the Rattlesnake Anticline 10 miles west is a little more than twice the size of the Oregon Basin structure. 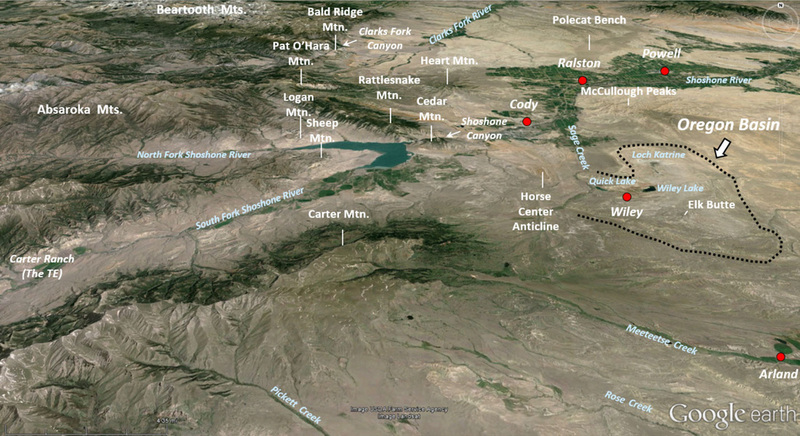 Anticlinal structural traps account for almost all the production in the Bighorn Basin. There are two petroleum systems operating in the Bighorn Basin: Cretaceous marine shales, and the Permian Phosphoria shale members. A petroleum system includes all the elements (source, reservoir, trap, and seal) and processes (maturation, migration, and preservation) required for a petroleum accumulation to occur. An oil field is the place where all these geologic threads serendipitously intersect to provide a resource human ingenuity has learned to exploit. The Cretaceous System relies on the organic-rich shale deposits of the Interior Seaway (110-70 million years) for source rock and the marine and fluvial sandstones for reservoirs units. Impermeable beds provide seals, while the Laramide anticlines (70-52 million years) make excellent structural traps. Accumulations in the Cretaceous system are mainly gas prone, with some light oil and that are generated within the Bighorn Basin. These were the first reservoirs discovered in the basin in 1906. Cretaceous System had produced 94 million barrels of oil and 830 billion cubic feet of gas as of 2010. The Permian System has a more complicated history. The source rock was deposited and matured in eastern Idaho and the oil migrated eastward through the rock to Wyoming. When the oils first migrated (160 million years), the structural traps did not exist. 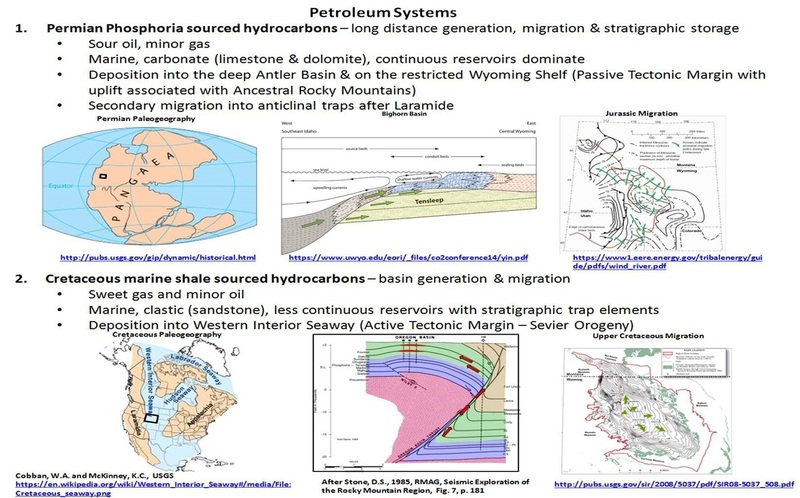 Oil was held in regional stratigraphic traps and remigrated into the anticlines with the onset of the Laramide Orogeny. Bighorn Basin cumulative production as of 2014 was approximately 2.67 billion barrels of oil and 3 trillion cubic feet of gas. The Permian system is responsible for 80% or more of the oil recovered. The U.S. Geological Survey was the first to map and report on the geology of Oregon Basin, and to recognize its potential for a hydrocarbon accumulation. C. A. Fisher produced a geologic map of the Bighorn Basin in 1906 and C.W. Washburn mentioned the potential of structures on the west side of the basin. T. L. Harrison, a mine inspector with the U.S. Land Office, who was sent to investigate coal resource for land withdrawals, in 1908, recognized the oil potential of the anticline. He resigned from his government position in 1910, joined Enalpac and began to investigate how to exploit this apparent resource. Harrison and his French investors (Enalpac) found big gas reservoirs with three wells in lower Cretaceous sandstones at a depth of about 1,300 feet. The reservoirs in the Cretaceous petroleum system include the Cretaceous Frontier and Cloverly, the Triassic Chugwater, and the Cambrian Gros Ventre and Flathead formations. However, they did not have the technology to drill through the shallow Cretaceous Cloverly gas zones to test the deeper horizons. The company eventually lost their leases because of inactivity in the field (WWI also played a role in restricting financing from the French investors). Ohio Oil (Marathon) made the first deep oil discovery in the Permian system in 1924. They used a rotary drilling rig with better bit and mud systems than Enalpac had, to penetrate the troublesome Cretaceous gas sands. Reservoirs in the deeper Phosphoria petroleum system at depths of 3,000 to 4,000 feet include the Permian Phosphoria, Pennsylvanian Tensleep and Darwin and the Mississippian Madison formations. 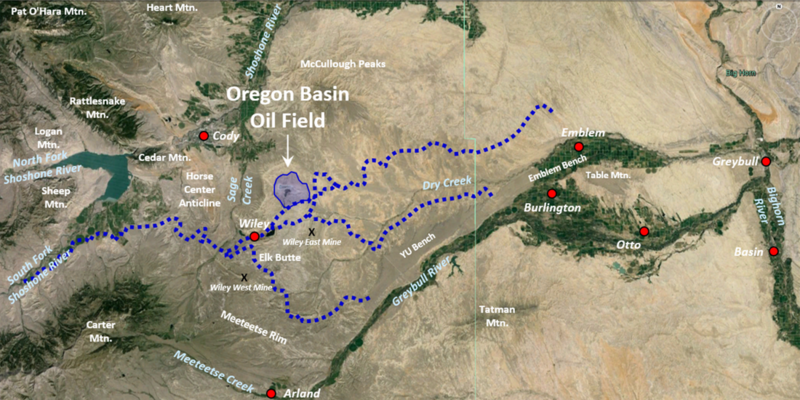 Oregon Basin field has a cumulative production of about 500 million barrels of oil and 308 billion cubic feet of gas from nine reservoir horizons within the two petroleum systems. At today’s prices of roughly $50 per barrel of oil and $2.50 per MCF gas, the cumulative oil and gas produced would be worth about 26 billion dollars. It has generated high paying local jobs for a 100 years and created wealth for the oil companies, royalty owners, county, state, and federal government. Unfortunately, it is mostly depleted producing only about 5,500 barrels of oil per day compared to over 36,000 BOPD at its peak in 1968. The pumps in the wells lift about 670,000 barrels of fluid per day and the surface facilities separate and skim off the less than one percent that is oil. There are 652 total wells with 342 active producers, 188 active water injectors, 74 idle wells and 47 plugged and abandoned wells. Most of the producers have submersible pumps because they produce more than about the 500 barrels of fluid a day that a pump jack can efficiently handle. The major reservoirs in the Phosphoria carbonates, Tensleep sandstones and Madison carbonates were drilled with vertical wells on 10 to 20 acre spacing. Horizontal infill wells were drilled late in the life of the field threading between the existing verticals. This anticline has two structural high areas called the north and south dome of Oregon Basin where most of the wells were drilled. In 2016, Marathon Oil sold all their interest in the Oregon Basin after 92 years as the field operator to Merit, a private oil company out of Texas. Wiley’s Oregon Basin Irrigation Project. The 270 mile project included a long canal to OB, 4 tunnels, large reservoir, laterals and supply ditches. Blue dashed lines show location of proposed water paths. Shaded blue area shows location of proposed reservoir in North Oregon Basin (complicating the development of the yet to be discovered oil field). 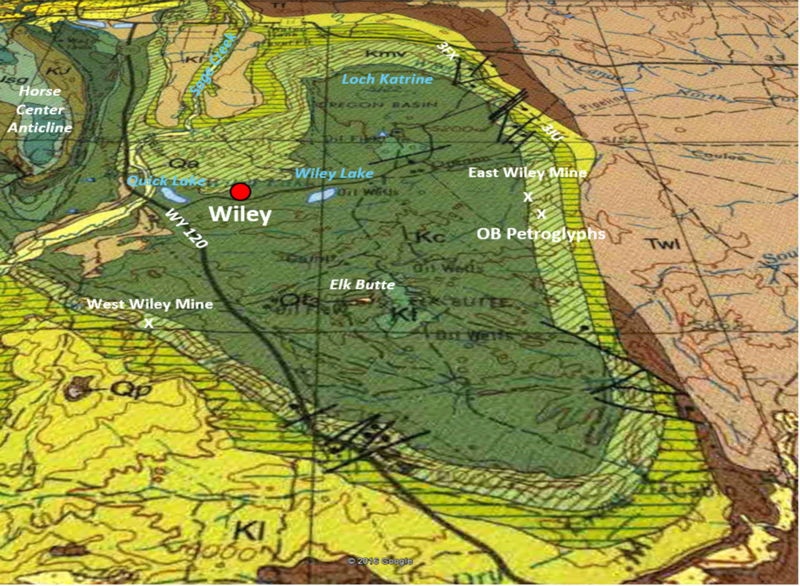 The location of Wiley’s coal mines to power the steam shovel are marked with an “x”. Image from: Base: Google Earth Image; Overlay: Johnston, C.T., 1909, Irrigation in Wyoming: USDA Office of Experimental Stations Bulletin 205, p. 42. We recommend a hike on the Mesaverde sandstones on the northwest edge of the anticline for a safe view of the field and anticline, or a hike, bike and ATV ride to some petroglyphs on the east side of the field and anticline. Although the main paved road through the oil field is a public county road and most of the land is BLM, we don’t recommend driving it because the field produces dangerous sour gas. Sour gas is methane with hydrogen sulfide that is lethal in very small quantities. Hydrogen sulfide is invisible and heavier than air, thus it settles in low areas. All field personnel wear sour gas monitors to alert them of dangerous concentrations. At extremely low concentrations of hydrogen sulfide, it smells like rotten eggs. At slightly higher concentrations, it kills the sense of smell and is lethal. So for safety reasons don’t drive or walk anywhere near the field, wells, facilities or pipelines. The field has an industrial feel with all the surface facilities and numerous well pads, so you are not missing anything by skipping a drive through the field. Starting at the intersection of US 14-16-20 (Sheridan Ave) and US 14A (16th St) in downtown Cody, head east on US 14-16-20, 2.2 miles junction with WY 120, 2.5 miles Yellowstone Regional Airport, 3.1 miles KOA, 5.2 miles turn right on Sunset Rim Road (3EXS), 6.5 miles end of pavement go straight, 6.9 miles go through gate (federal land beyond gate) and road splits into three choices, park car, take fork to left and hike uphill on gravel road to ridge with pine trees. Hike climbs 600 vertical feet over 1.2 miles (total out and back 2.4 miles). Once you reach the ridge, you have the choice of walking the sandstone ridge either to the east or to south as far as you like or just returning to your vehicle. This is all federal land. If you look south at the base of the cliffs, you can see the remains of the abandoned Wiley canal (looks like dirt road), north dome of Oregon Basin Field is to southeast, flat topped butte nine miles to south is Elk Butte on the south dome of Oregon Basin Field, salt flat to southeast is dried up Loch Katrine, nice views of Carter Mountain to southwest, Cedar and Rattlesnake Mountains to west, Heart Mountain to northwest and Beartooth Mountains behind in the distance, McCullough Peaks to north. Starting at the intersection of US 14-16-20 (Sheridan Ave) and US 14A (16th St) in downtown Cody, head east on US 14-16-20 toward Greybull, 2.2 miles junction with WY 120, 2.5 miles Yellowstone Regional Airport, 3.1 miles KOA, 5.2 miles Sunset Rim Road (3EXS) on right with optional hike to Oregon Basin Mesaverde sandstone rims (see above), 6.6 miles Bluebird Lane on right with optional mountain biking on Oregon Basin sandstone rims at Slick Rock (see MTB Project http://www.mtbproject.com/trail/2349861), 9.1 miles turn right Oregon Basin Road (3FX), 11.9 miles road forks take left on gravel road 3JU, 13.6 miles compressor station, 14.5 miles compressor station, 15.1 miles Dry Creek drainage, 15.2 miles turn right off gravel road and park in flat area near gate. Hike, mountain bike or ATV ride is 8 miles total out and back on mostly flat dirt road on BLM land. Hiking takes about three hours total and traverses dry sage brush country except for a few sandstone ridges with pines. Be careful for snakes. The petroglyphs are nice, but certainly less extensive than the Bighorn Basin petroglyphs at Medicine Lodge Archeological Site (http://wyoparks.state.wy.us/Site/SiteInfo.aspx?siteID=25) and Legend Rock State Petroglyph Site (http://wyoparks.state.wy.us/Site/SiteInfo.aspx?siteID=34). Open and close gate at 0.0 miles and walk on dirt road toward southwest that is on south side of Dry Creek drainage, 0.9 miles road forks take right fork, 1.4 miles cross drainage, 1.7 miles road forks take right fork, 1.9 miles gate at top of ridge, 2.4 miles road parallels east side of Dry Creek drainage and heads south (water in creek is discharge from Oregon Basin Oil Field), 2.9 miles remains of Wiley coal mine on left in Mesaverde sandstone outcrop, 3.1 miles remains of East Wiley coal mine on left, 3.9 miles road junction take curve to left, road heads east and cuts through sandstone outcrops, 4.0 miles BLM archeological sign, remains of small rock house, chain and pipe restricting access for vehicles, leave road by walking left toward sandstone cliff with red iron oxide stain and petrogylphs. Walk up ravine to north to see additional panel of petroglyphs. Please do not disturb, damage, remove or mark on this cultural resource. You can return to your car the same way, or return by hiking via a loop as follows: continue up ravine to north for short distance and hike over sandstone outcrop to join dirt road. Follow dirt road to northeast, 5.1 mile gate and gap in outcrops head east or right, 5.2 mile take hard left at road junction to head north, 6.0 mile turn right at junction with road you originally walked in to the petroglyphs, 7.8 miles back to parking lot.